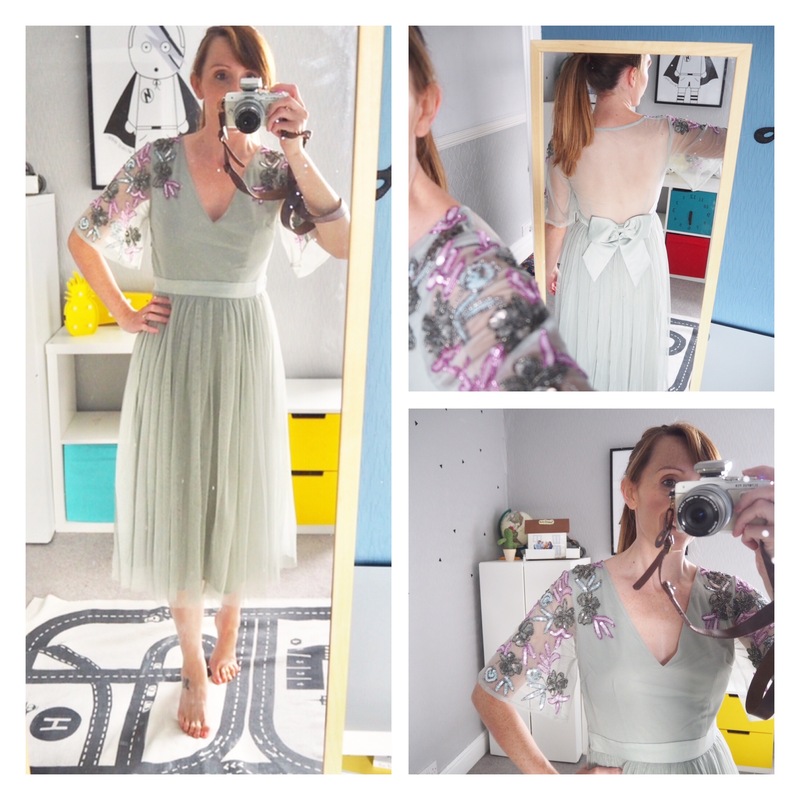 What mama might wear … help me choose a wedding outfit! If you know me, you’ll know that I’m very indecisive. As in very, very indecisive. And when it comes to clothes, I do my very worst decision making. To the point where I ended up ordering five dresses from ASOS for an upcoming wedding. Then the minute I paid for them, I regretted not buying the sixth dress I liked, and added that to the basket immediately after. Anyway, I’m now in the position of having five dresses (the sixth WILL NOT do up at the back) and have just over a week to decide which to wear. This is where you come in … I’ve tried on and taken pics of the selection, and need a helping hand deciding which to wear. Ignore the hair and lack of make-up, this was after a long few days in work. Dress number one is a maxi dress, which has a white background with pink and red embroidered flowers and mesh off-the-shoulder sleeves. 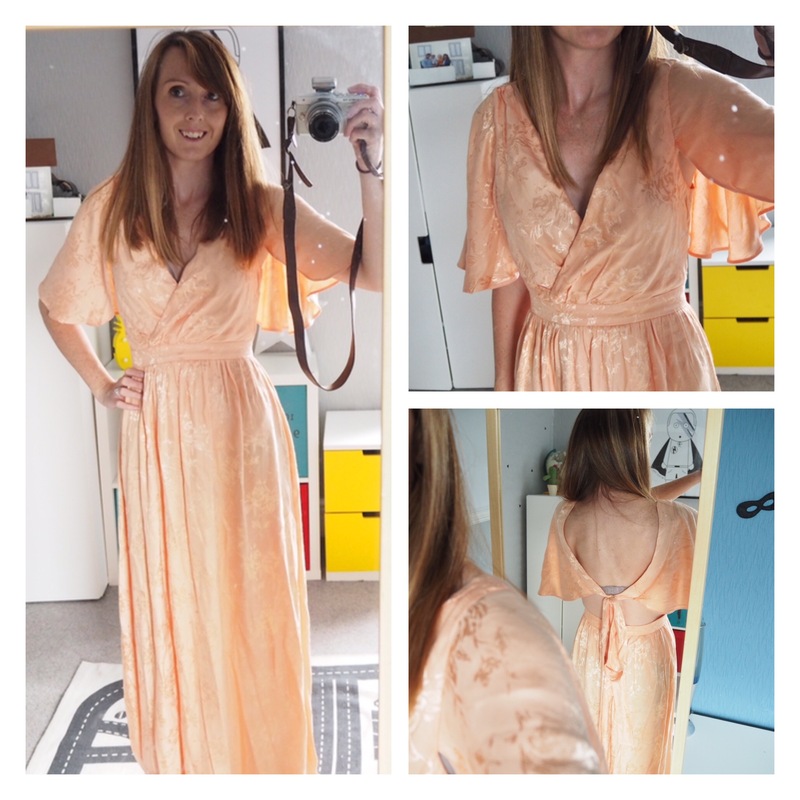 I don’t usually wear maxi dresses, but I liked how floaty and boho it looked online, and thought it would be nice for an August wedding. 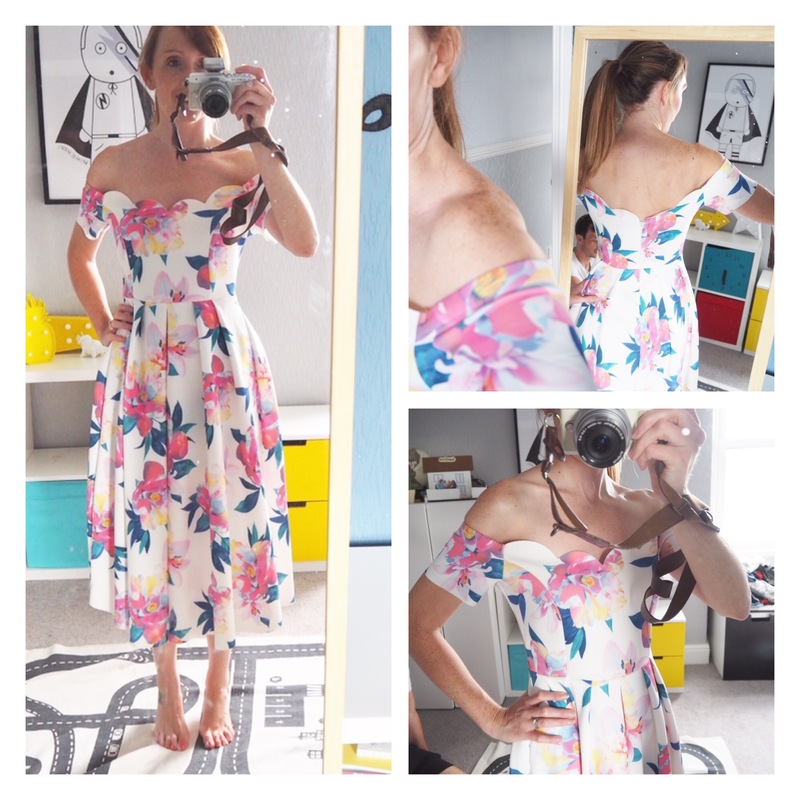 I loved it at first, but after trying it on again, I’m not 100% sure about the spaghetti straps, and feel like it might look a bit like a maternity dress from the side. Dress number two was one of my favourites when I was filling my basket. 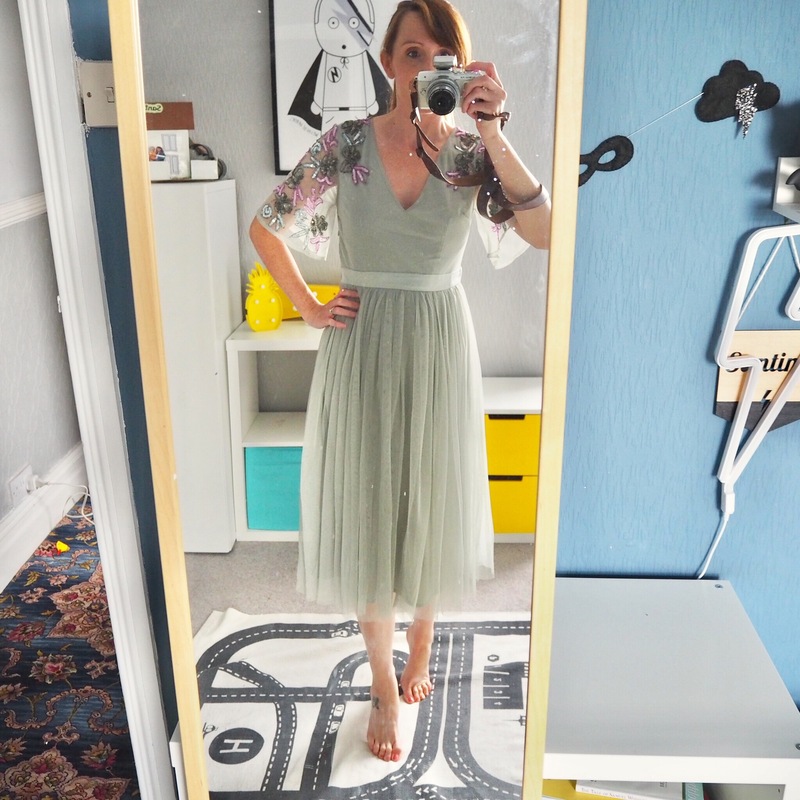 It’s an embroidered dress with a tulle skirt, and I loved how swishy and feminine it looked. I was a bit put off by the colour when I first opened the package, as it was described as green online but was more of a grey in reality. I really like the embroidered sleeves, which are also a lovely shape. The skirt feels lovely, and the back has a super cute bow. Surprise surprise, this one was full price at £65. My problem with this one is that I ordered rose gold sandals, which don’t go with the silvery embellishment. 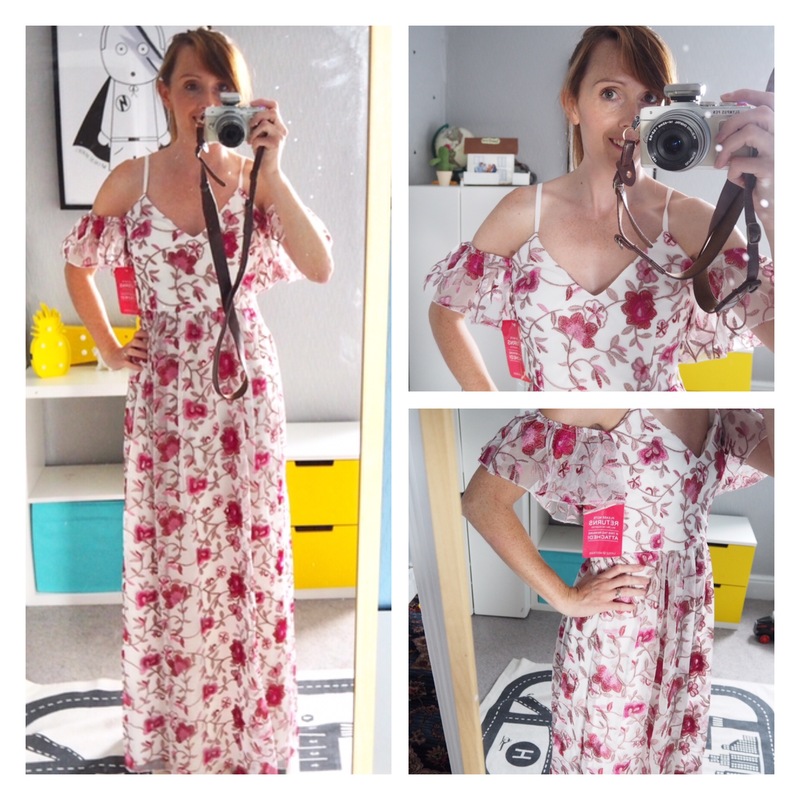 Next up is another maxi dress, which was a bit of a brave order as it’s quite unusual and probably not to many people’s tastes, but I thought it might look vintage on. It’s a peachy colour jacquard dress with a kimono-style wrapover top and a tie back. It was a bargain in the sale at £37.50, but it’s not really me. The sleeves fall down quite easily and it’s very low cut, and I’m pretty sure I’d end up flashing soon into the day. I also can’t get the bow to look right in the back. 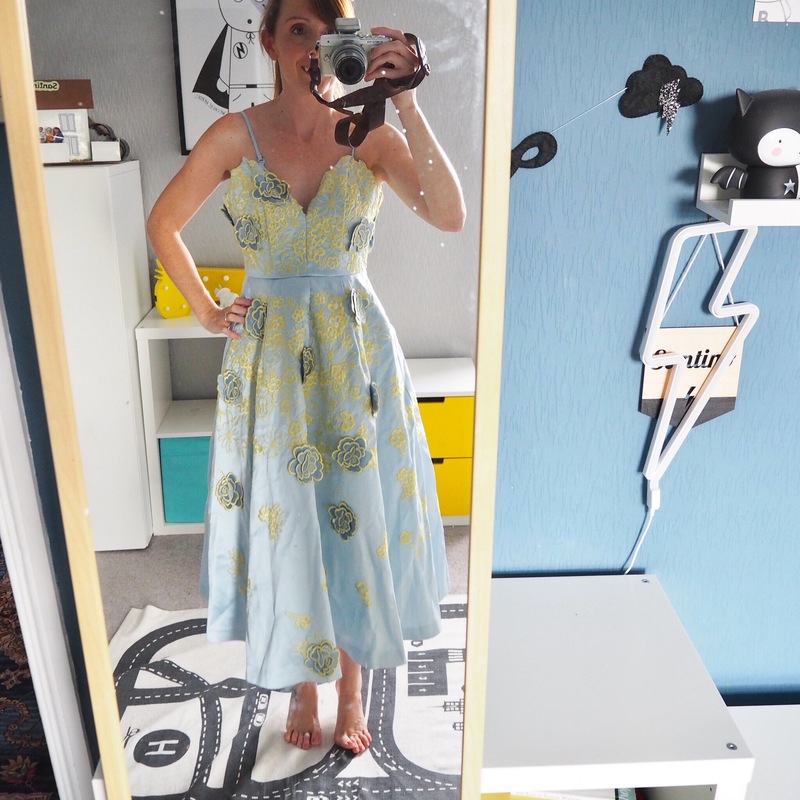 As soon as I saw the next dress I had to order it … I loved the 50s style shape, and felt like it would suit me. 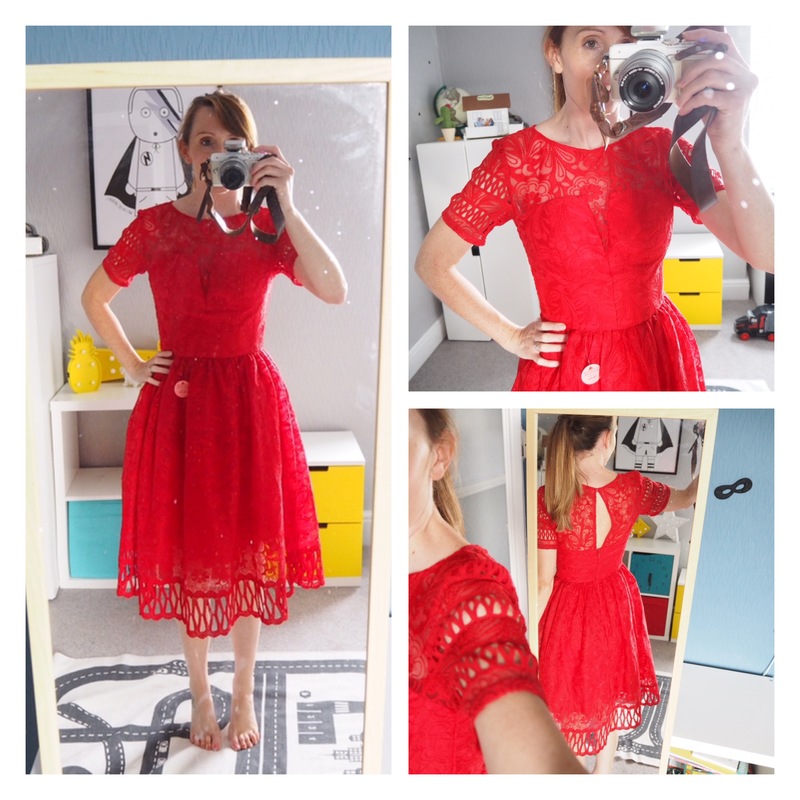 I never wear red (apart from my Primark sundress), but I was drawn to it as it stood out among the other dresses and it would be something a bit different for me. It was the most expensive dress I ordered, at £75, and is a Chi Chi London dress. The colour is beautiful, I love how puffy the skirt is, and it’s nice and thick so no worrying about it being see-through or falling down. Despite me never wearing red, I feel really comfortable in this, and it’s probably the most “me” of all the dresses I’ve ordered. That’s a good thing, bit I was hoping to find something a bit more unusual. Before you even see the next one, it’s a no. The colour is pretty, and very summery, but it is far too low cut for me, and looks a bit like net curtains. It’s a shame as the back is lovely. Onto the last of the new buys. 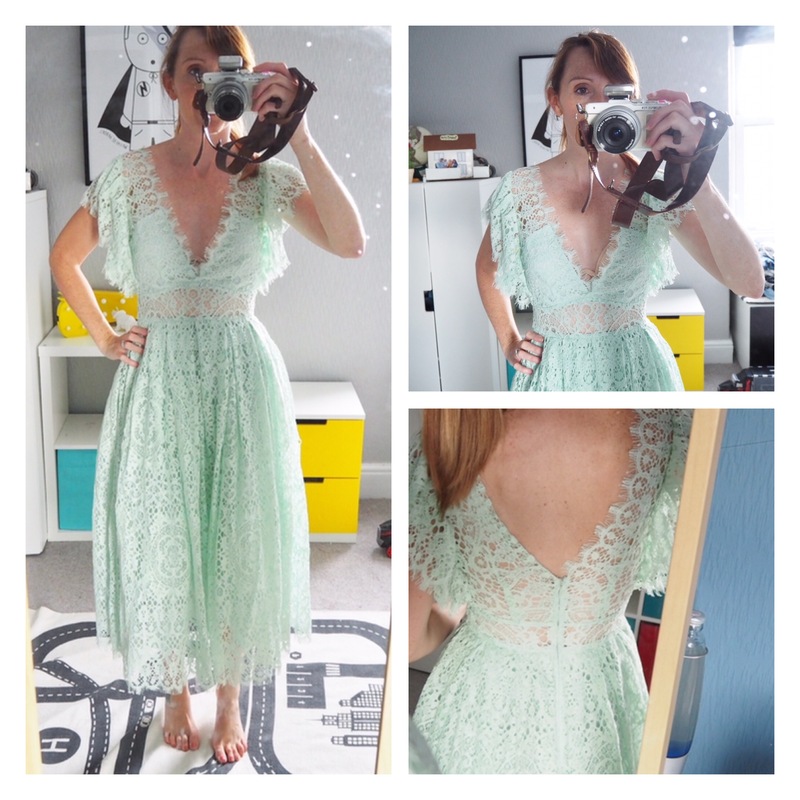 This one was reduced from £150 to £37.50 and I was desperate to try it on. I’d managed to get the last one in stock after refreshing the page a few times, and was so excited when it arrived. I don’t think the photos do it justice as it’s very pretty in real life and quite different, but unless I have a couple of ribs removed I have no hope of wearing it! 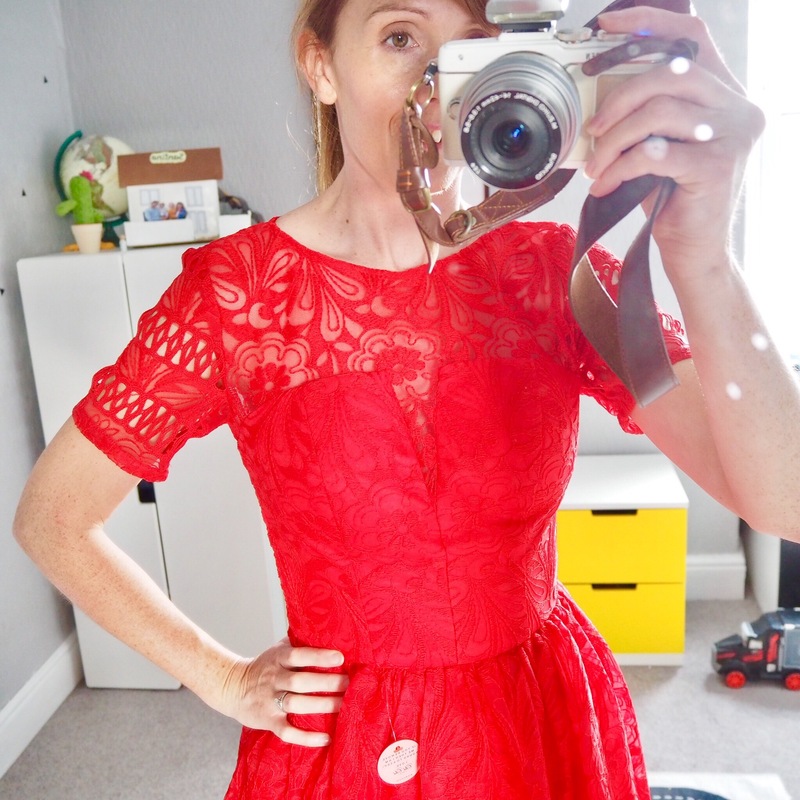 And finally, this is a dress that I bought for a wedding last year, which at this rate I might well end up wearing again. The reason I wasn’t going to wear it is partly because of the Bardot-style top as I’m worried the sleeves would annoy me if I need to pick the boys up during the day, and secondly, a white dress with two children will only end in disaster. But I do love it and it would save me a bit of money! What do you think? I’d love some help in choosing, so let me know your favourite! Embellised sleeve dress, that looked stunning on you. They are all fabulous. I like the red prom dress and the outfit repeater – why spend more when you can update a dress you have already with different accessories.